A basic, small gas grill, the 2-burner Weber Spirit E-220 also has a 12,000 BTU side burner for those who find this sort of thing useful. 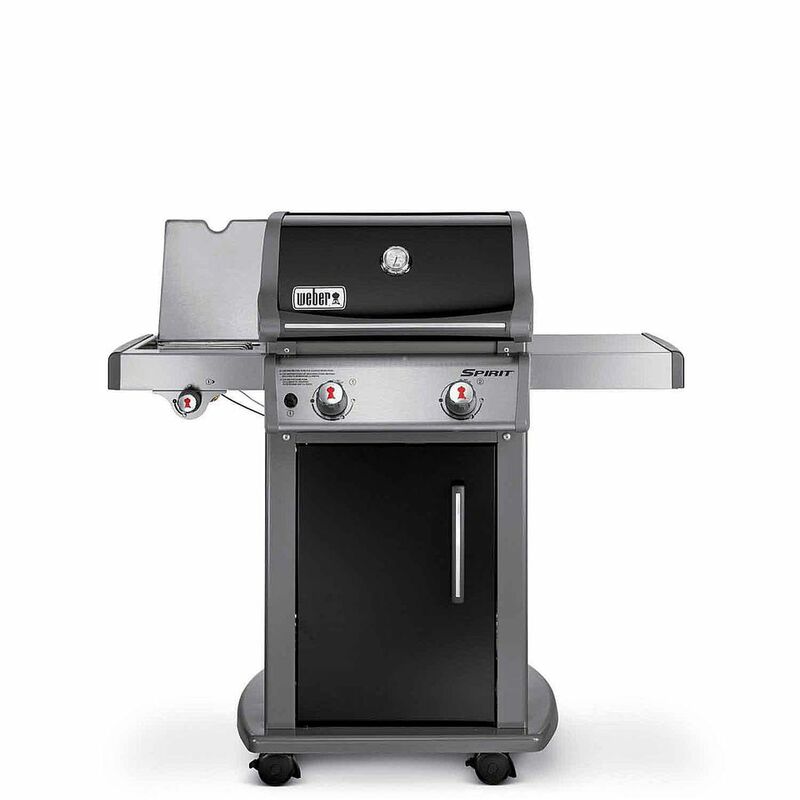 One important difference between this model and the other Spirit 200 series grills is that those models have fold down side tables to reduce the footprint for those with very small spaces. Because of the side burner on this model, the tables do not fold down. First of all this is the same as the Weber Spirit E-310 but with a 12,000 BTU side burner and static side tables. If there is no need for a side burner, then it would be best to save the money and get that grill instead of this one. Additionally, because the of the side burner on this grill the side tables do not fold down, an advantage if space is limited. New for 2013, the Spirit E-220 is a little grill with 360 square inches of primary grilling space and a 12,000 BTU side burner. This is still a simple grill and while capable of indirect cooking, and even rotisserie cooking, the size is limiting, but then that's the idea. This is a small gas grill for a small space. Aside from being small, this is a very basic 2-burner gas grill with a side burner. The 2 burners generate 26,500 BTUs of heat under 360 square inches of porcelain coated cast iron cooking grates. This is not a powerful grill and preheat times are long. However, the grates hold a lot of heat and allow for good heat transfer. This grill will do a good job of grilling a steak or burgers. The temperature range is wide, so low temperature cooking is very good. The 2-burner design gives enough space to indirectly cook a whole chicken or a roast, but the capacity is limited. The construction is good. Weber abandoned higher quality stainless steel in favor of price control, so this doesn't have the durability of Weber's of the past, but it is still a well made grill. The majority of the body is enameled steel, something Weber is very good at. This grill is the same price as the stainless clad Spirit S-210, but with the addition of the side burner. I would recommend this model over the S-210.